The underlying premise of uninsured motorist insurance coverage in Maryland, as it is in most states, is to put the car accident victim in the same position they would find themselves in had the at-fault driver had liability coverage equal to the coverage of the accident victim. I'm oversimplifying a bit because you can have UM coverage in some instances that is less than your liability coverage. But, in the vast majority of cases in Maryland, your liability coverage mirrors your uninsured motorist coverage. So in a pure uninsured motorist case where the other driver either cannot be identified (hit-and-run or phantom vehicle are the most prominent examples) or has no insurance, your insurance company essentially steps into the shoes of the defendant, assuming the at-fault driver's liability for the accident and also his damages. This is a simple concept but for Maryland accident victims it is conceptually difficult to get your mind around. Why is my insurance company defending the guy who hurt me? Why is my own insurance company now essentially my adversary? As crazy as it seems and as aggravating as it might feel to have your insurance company turn against you, it is a good thing for you because while the insurance company is essentially defending the bad guy, they are also paying the money that bad guy would have paid you if he had insurance. Uninsured and underinsured motorist coverage leaves money available to you for compensation of your car accident claim when an accident is caused by a driver who either has no insurance or does not have enough insurance coverage to pay for your medical bills, lost wages, and pain and suffering. In 1981, the Maryland legislature expanded uninsured motorist coverage to include the scenario where the at-fault driver had liability coverage less than the amount of uninsured motorist insurance possessed by the insured/victim. So, in underinsured cases in Maryland, the at-fault driver has insufficient liability insurance to cover the accident victim's loss, the victim's insurance can step in to bridge the gap between the at-fault driver's coverage and the victim. Let's use an example to illustrate: you have an underinsured insurance policy with $500,000 in coverage and a claim that is worth $400,000. But the at-fault driver has only $100,000 in insurance coverage. In this situation, the insurance company for the driver at fault for the accident would pay their entire policy limit of $100,000 and your insurance company would pay the other $300,000 to make your claim "whole." In most underinsured scenarios in Maryland, this law is clear and the math plays out as simply as the example above would illustrate although additional complexities can arise when policies involve a single combined limit and more than one victim in the accident. Regrettably, like most states, Maryland law does not permit the stacking of insurance coverage. Individual recovery of uninsured motorist benefits is limited to the per person limit of the applicable uninsured motorist policies. Using the scenario above, the total available insurance coverage is $500,000, not $600,000. This is true even if the claim is worth more than the $500,000 uninsured policy, the total recovery from your insurance is limited to $400,000. 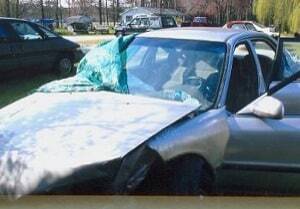 What is the Statute of Limitations for Uninsured Motorist Claims in Maryland? An insurance company's failure to pay the money that is "fair" for the settlement of an uninsured motorist claim is a breach of contract with their insured. Accordingly, the three-year statute of limitations governing breach of contract actions in Maryland is applicable. But any smart Maryland car accident lawyer - absent a compelling reason - just artificially assumes the general statute of limitations applies. Do You Need a Maryland Accident Lawyer for Your Underinsured Motorist Claim? Our firm has handled hundreds of uninsured traffic collision claims and has dealt with a wide variety of complicated legal issues that arise in these cases. We handle only serious injury claims. One of our lawyers is a professor of insurance law who remains particularly current on these issues. Our our entire team of advocates are extremely are well versed in Maryland uninsured motorist law. Our goal is clear and simple: to maximize the amount of money you recover in your case. If you want to discuss your potential case, call 800-553-8082 or click here for a free uninsured motorist internet consultation.